The ~63 acre Coldbrook Preserve has close to two miles of marked trails that wander through wetlands and towering pines in the Town of Northumberland, New York. 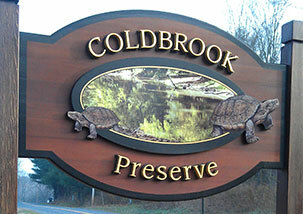 The Coldbrook Preserve was officially opened in April of 2013 after Jim & Christine McKnight donated the property to Saratoga PLAN, fulfilling their long-term dream of seeing the land permanently conserved. Although the property was once primarily farmland, the preserve has since grown back to forest, and has a section of the Cole Brook stream running through the land. The Coldbrook Preserve provides a significant buffer to wetland habitat for the Blanding’s Turtle, a New York State threatened species that was discovered in the Wilton area in 2003. Like all of our projects, the Coldbrook Preserve was the result of long-term planning and the collaborative efforts of landowners, volunteers, donors and project partners. Financial support came from RBC Wealth Management’s Blue Water Program, the NYS Environmental Protection Fund, the Town of Northumberland, and many Saratoga PLAN donors. The Leadership Saratoga Class of 2011 designed the preserve’s trails, and Eagle Scouts helped make trail improvements by adding bridges and benches. From Saratoga Springs head east on Lake Avenue (Route 29). After approximately 7 miles, take a left onto Homestead Road. In about a 1.9 miles you will see the Preserve sign on your left-hand side. Parking for this preserve is along the road. One of the biggest threats to all turtles, including the Blanding’s Turtle, is road crossings. Many turtles travel long distances to their nest sites and many have to cross roads to do so. Be careful in your travels and look out for turtles in the road. If you need to move a turtle out of the road, be sure to move it in the direction it was facing.